Worst Best Picture: Is Chariots of Fire Better or Worse Than Crash? In “Worst Best Picture” we search every single Best Picture Oscar winner of all time from 1927 to present to uncover the worst of them all. Conventional wisdom says that 2005’s winner Crash is the worst winner in history. We won’t stop until we’ve tested every last one. Read the the first, our review of Crash, here. Posts will be relatively spoiler free, but there may be some details revealed. 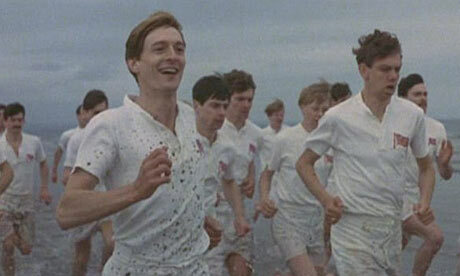 Today’s installment is the 1981 winner Chariots of Fire. Is it better than Crash? Your typical sports movie is the story of an underdog either defeating a superior enemy or competing valiantly and losing. Chariots of Fire doesn’t exactly follow the template, but it’s assuredly still a sports movie that is about a bigger struggle. It’s the story of a Christian missionary and a Jewish student at Cambridge and their struggles as they prepare to run in the 1924 Olympics. The actual running itself is iconic, you almost certainly know the training scenes and the song even if you haven’t seen it, but it mostly doesn’t deserve commentary. It’s standard sports-movie fare: one guy beats the other, the other trains hard in suspect ways, they meet again in a final showdown for personal glory and country and all that. It’s the background of Chariots of Fire that is much more interesting. Most commentary on the movie uses the same word to describe it: quiet. That’s not a bad word, for sure, since most of the other Best Picture winners are about war or a great struggle, but while no great army descends on France in Chariots of Fire, there’s plenty of struggle. Harold Abrahams, the Jewish runner, faces continual antisemitism that ranges from some teasing on his first day at Cambridge about the ethnicity associated with his last name to some deeper insinuations about why he wants to train so hard to win Olympic gold. One of the great strengths of the film is the ability to sell the difficulty of being Jewish in this life — Cambridge, the Olympics, and Britain in the 20s — without being too heavy handed. The missionary, Eric Liddell, faces his own off-track problems. He’s Scottish and comes from an intense family full of people who wish he would quit running and go be a proper missionary. I found myself particularly moved by the idea that this man who had a chance to become one of the all-time greats in his field was being constantly reminded that “his field” was supposed to be something altogether different. Parents just don’t understand, even 90 years ago in Scotland. Liddell has to balance his running with his dedication to his faith, and as in all things one has to lose. His ultimate test comes when he is told at the last second that the most important race of his life is not on a normal day as he was told, but on Sunday. It’s a particularly interesting idea of a personal challenge, as most movies wouldn’t be able to handle the tone required. The Best Part: After insisting that he will not race on a Sunday, Liddell is met by a series of increasingly important people who try to lean on him. It’s understated — no one yells at him — and that’s a great strength of the sequence. They respect his convictions, but they’ve got to win this damned race. The scale of the Olympics in 1924 is also pretty wonderful. It looks more like a high school football game in a very small town, which is charming. The Worst Part: A lot of the Scottish missionary scenes tend to feel out of place in a narrative that otherwise goes very directly towards the final race. It’s important to establish Liddell as conflicted, but it may not be necessary to do it to this degree. The Americans towards the end also feel a bit silly, but that’s me speaking as one of them. It’s amazing how consistent “Americans” are treated in films like this, and at least my countrymen get out of Chariots of Fire mostly as silent plot points. Is It Better or Worse than Crash? It’s certainly better, if for no other reason than that “quiet” distinction. Chariots of Fire isn’t a template a lot of movies can reuse, but it’s a tone that anyone attempting to get a message across like this could stand to benefit from. It’s a way to tell a story and make a point without yelling into the camera. Crash is terrified you won’t “get it” and Chariots of Fire trusts that you can watch the movie and take it in on your own. ← Worst Best Picture: Is Around the World in 80 Days Better or Worse Than Crash?